The Pamban Railway Bridge is the longest and oldest railway bridge in India. The viaduct is 6776 feet (2,065 m) long and consists of 145 spans. Though the bridge was constructed at a time when technology was not advanced, it stands out as a fine example of construction. 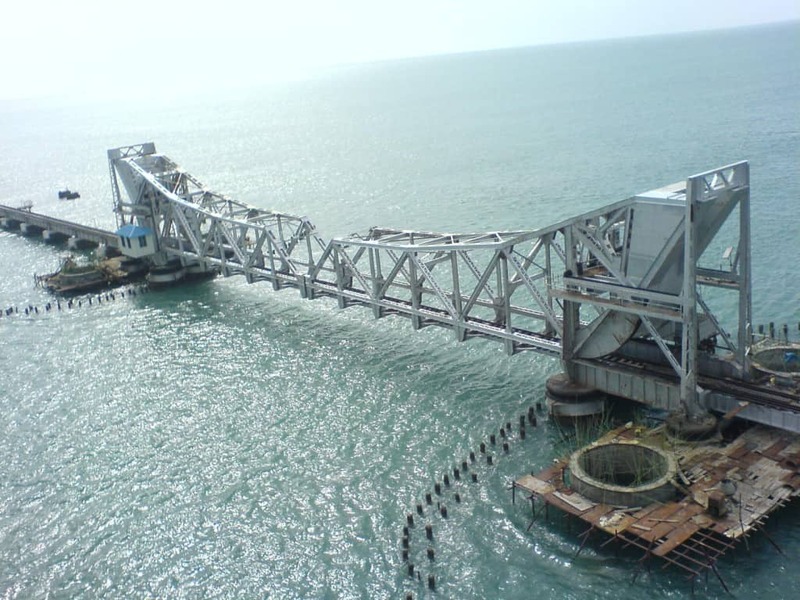 Pamban Railway Bridge is the oldest and the longest railway bridge in India. The Pamban Railway Bridge on the Palk straight links Pamban Island to the mainland India. Construction of Pamban Viaduct started in June, 1911 and completed in June, 1913, the Scherzer span started in July, 1913 and completed in Dec.’1913. The open able part of the Railway Bridge which is called the movable bridge in engineering terms has been in existence since 1912 and it is functioning in good condition. It is located in the world’s second most corrosive environment after Florida, making its maintenance a challenging job. 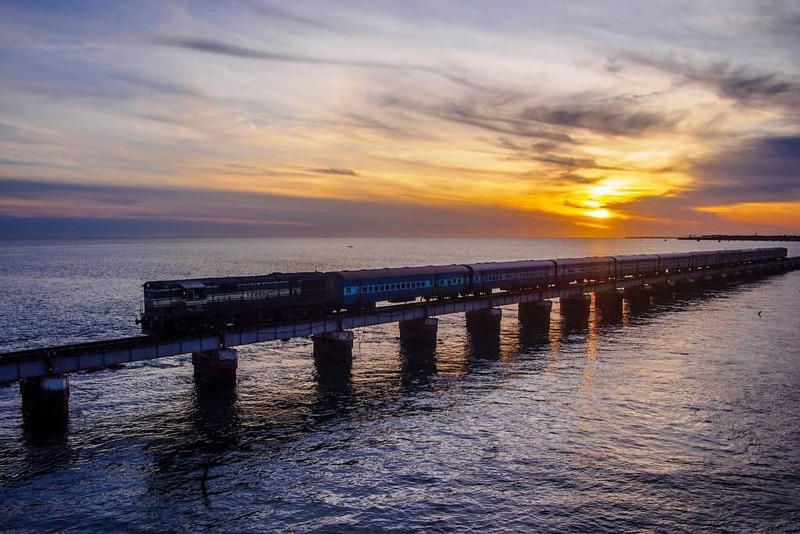 The honor of the building of Pamban Bridge, the only one of its kind in the whole world goes to South Indian Railway, one of the predecessors of the present Southern Railway. Total length of the bridge is 2.057 km. This bridge longest span which is 289 feet (88m ) long. The approximate estimated cost of construction is 537.57 lakh rupees. 600 workers were involved in the construction of this bridge. 4,000 tons of cement was used for construction. It is India’s first sea bridge. The bridge consist of 143 piers, out of 145 spans 143 of 40 feet span, one 43 feet span and another one was 44 feet span. 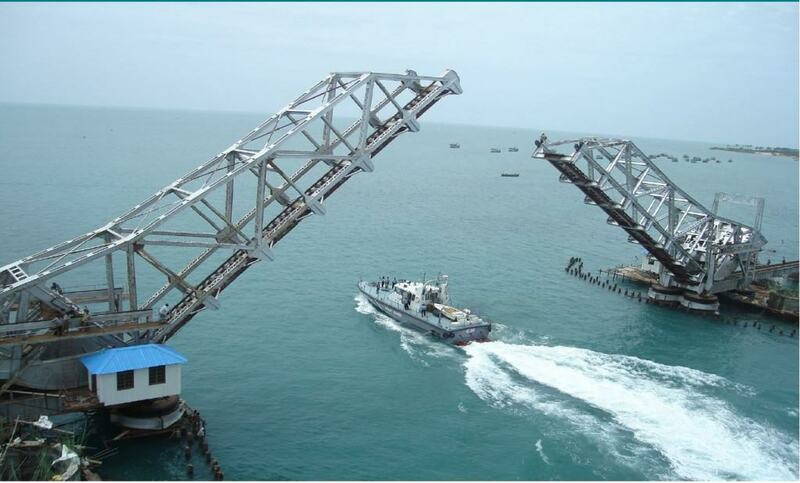 113 spans are on the West side of Pamban channel and 32 spans on the East side. East side is spanned with two leaf Scherzer Rolling Lift Bridge. This bridge longest span which is 289 feet (88m ) long. The bridge was designed by Scherzer Rolling Lift Bridge Company of Chicago. The bridge was constructed by Head, Wringtson & co, Ltd of Thornaby-on-tees. The Pamban railway bridge is considered an engineering marvel and it was built within two years. 600 workers were involved in the construction of this bridge. The approximate estimated cost was 537.57 lakh rupees. The devastating cyclone’ of 22nd December 1964 washed away the bridge. Because of the importance. of-the bridge it was repaired within two months. The railway line to Dhanushkodi was also damaged during the cyclone. Prior to the 1964 cyclone, an anemometer was permanently installed at about the middle of the bridge. Whenever the wind velocity exceeded 64/h km it signaled danger. That too was washed away by the tidal waves and it was later replaced with a new one in 1965 which flashed danger signals when the wind velocity was 48/h km and later this limit was enhanced to 58 km/h (16m/s). The Pamban Railway Bridge is also called as Cantilever Scherzer Rolling Lift Bridge. It was named after the German engineer Scherzer, who built the Pamban viaduct. The Scherzer roll and lift span are activated by using the principle of spurs and gears to gain a large amount of mechanical advantage. It is operated manually. For the passage of the vessels the bridge-is, lifted. The Port-Officer informs the bridge operator the date and time of crossing of the steamer. The bridge operator informs the Station Master and the Controller before he lifts the bridge. The entire operation takes nearly 40 to 50 minutes. The stone and concrete metals used for the bridge were brought by rail from a quarry which was situated 270 km away from Pamban. Sand came from a site 100 km away. 4,000 tons of cement, 1,36,000 cubic feet of clay, 18000 cubic feet of crushed metal, 163000 cubic feet of sand and 80,000 cubic feet of boulders were used to construct the Pamban Railway bridge. The year 1964 is memorable in the history of South India and also in the pages of Southern Railway. On 22 December 1964 a storm formed in the Bay of Bengal in the eastern direction of Dhanushkodi town. A wave of 20 feet lashed the town and the speed of the cyclone was calculated as 120 kilometres per hour. The cyclone wiped off Dhanushkodi from the map. Many people lost their lives while they were sleeping. The cyclone formed around 12.30 pm and lasted for 24 hours and devastated Dhanushkodi. After the cyclone, a portion of the railway track at Dhanushkodi was also swept away. The Southern part of Dhanushkodi surrounded by the buildings including temples was submerged in the sea. On that day, the six coaches Pamban Dhanushkodi passenger train No: 653 left Pamban at 11:55 pm with 110 passengers including a party of school students37 and five members of the railway staff. The signal at Dhanushkodi failed and the train stopped for a while, in pitch darkness around and there was no indication of the signal being restored. The driver then gave a long whistle and decided to take the risk. The train started rolling along the sea and suddenly a giant wave rose from the turbulent sea and smashed the train38. The initial reports put the casualty figure at 115 based on the number of tickets issued but it was suspected that the figure would be around 200 as more passengers were said to have traveled ticket-less on that night. Another major victim of the cyclone was the Pamban Railway Bridge built exactly 50 years ago. It was washed away by the tidal waves. It was 2.06 kilometers long and had 146 spans. One of the spans had lifting mechanism to give way to passing ships. Due to the cyclone 126 girders collapsed. Only 19 girders and the lift span named after its designer Scherzer were spared. In 1907 Sir Henry Kimber, the chairman of the South Indian Railway received an important deputation from Ceylon planters. In this deputation they wanted to improve the means of transport and communication between India and Srilanka. He contacted Lord Morley, the Secretary of State for India and Lord Elgin, the Viceroy of India regarding this. By this time, Ceylon Government agreed to construct a railway from Madavachu to Talaimannar, a distance of 67 miles. On Indian side Madurai Mandapam Railway was extended across the Pamban Pass by a bridge to the island of Rameswaram and then to Dhanushkodi. A meeting was held at Dhanushkodi on November 25, 1908 and it was attended by Sir Arthur Lawley, Governor of Madras and Henry Mc Callum, the Governor of Srilanka. They decided to build a viaduct across Palk Straight and run a ferry service between Dhanushkodi and Thalaimannar. The extension of the line from Dhanushkodi Jetty to Dhanushkodi point on the Rameswaram Island aggregating 10.15 miles was opened for traffic in 1914. The question of extending the main line to Ceylon over Adam’s Bridge was under investigation by the Railway Company. The distance between Dhanushkodi, the southernmost point of Rameswaram and Talaimannar on Mannar island was 21 miles. The idea of connecting these two terminal stations by a railway line on a solid embankment raised on the sand bank known as “Adam’s Bridge” was investigated in 1913 and the South Indian Railway Company made a detailed survey and prepared a project for it. This project looked at with attention the construction of a causeway from Dhanushkodi, on Indian side to Talaimannar on Srilankan side. Actual length between these two points was 20.05 miles of which 7.19 miles would be on the dry land of the various islands and 12.86 miles in water. The sections on dry land consisted of low banks of sand and presented no difficulty. But the section through the sea was to be carried on a causeway constructed in the following way; A double row of reinforced concrete piles pitched at 10 feet centre and having their inner faces, 14 feet apart were to be driven into the sand. These piles were to be then braced together with light concrete arches and chains and transversely with concrete ties, struts and chains. Behind the piles, slabs of reinforced concrete were to be slipped into position, the bottom slabs being sunk well into the sand of the sea bottom. The top of the concrete work was to be carried to six feet above high water level and the rails to be laid at that level. The total cost of the construction work at the two terminal points was estimated about 111 lakhs and therefore the scheme was given up for a simple one. Many proposals were made whether Pamban strait should be crossed by a causeway or arched viaduct with a swing bridge for passing ships, whether the strait should be entirely closed and an alternative passage provided by means of short light draft canal should be constructed across the island. At last it was decided to construct a viaduct in 19131. It was finally decided to build a viaduct over the Palk Strait to provide a railway service between Mandapam and Pamban and ferry service between Dhanushkodi of India and Talaimannar of Srilanka. 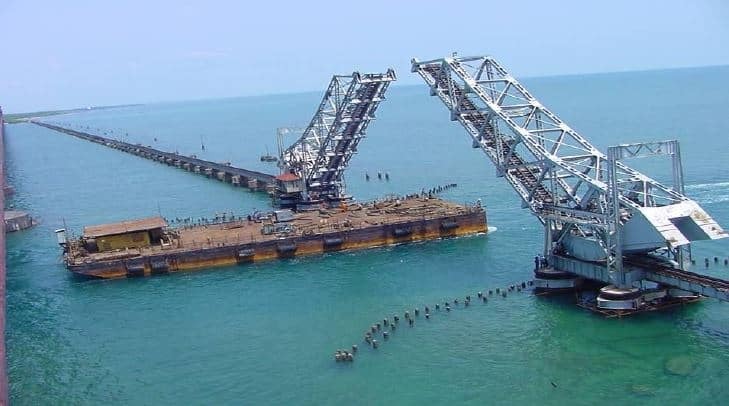 construction of Pamban Railway Bridge. The British wanted to reduce the traveling distance of its both colonies, India and Srilanka. The British also wanted to avoid the risk and delay in cotton trade. The soil of Rameswaram is very suitable for the cultivation of cotton. Tondi and Devapatnam of Ramanathapuram were the chief centres of cotton. The export of agricultural products and the expansion of tourism in Ramanathapuram district also induced the British to construct the bridge.